It's been a while since I posted anything, and it feels as if I've neglected my child (please don't tell on me). 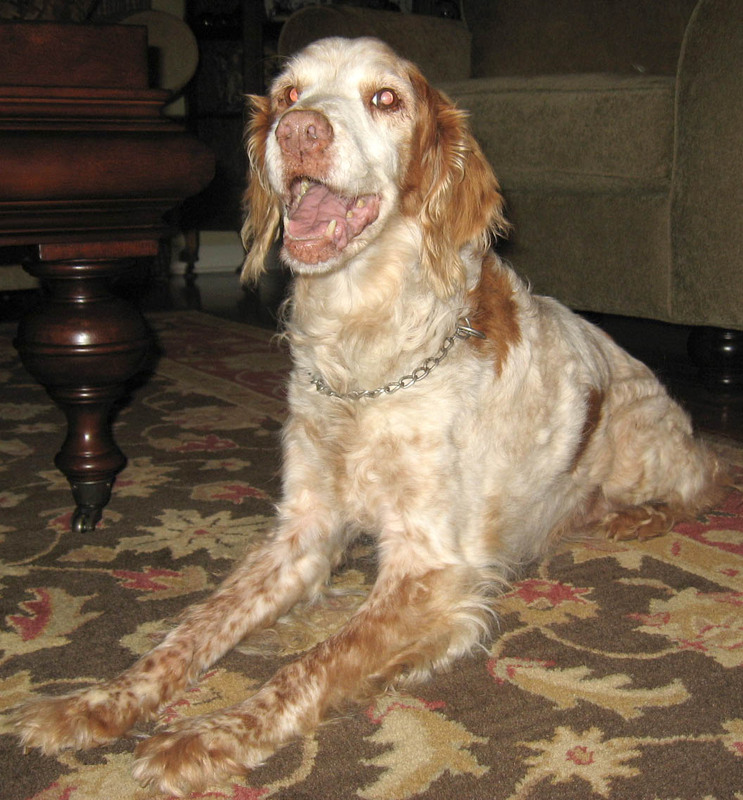 I've had a lot to share from the cookbook of the month and my two Thanksgivings, but between hours of cooking, sporadic internet at my parents' house, and having to say goodbye to my dog and best friend, it just never happened. Hopefully I can catch up over the next few weeks before I return to the land of no internet. It seems appropriate to dedicate this post to Rascal. One of her more unique traits was her undying love for vegetables and fruit. If she heard the rustling of a bag of spinach, she came running no matter where she was in the house. A few of her other favorites were carrots and broccoli, and her Christmas and birthday presents were usually some combination of these vegetables (she was never that into toys, and couldn't have most dog treats). In more recent years, she would anxiously watch while you ate an apple, knowing that she would get to enjoy the core. 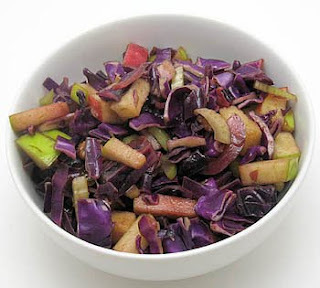 While I was chopping the broccoli and apples for this salad, all I could think about was Rascal. I wanted to "accidentally" drop a few pieces, but she wasn't there to eat them. Hopefully she's now enjoying all of the fruit and vegetables that she can imagine. Even though my opinion might be biased because of my associations, this salad was good, and probably would have been even better if I had used almond butter. 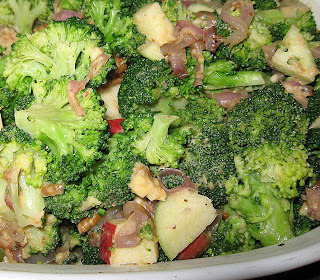 I liked the crunch from the broccoli, apples, and pecans, but it wasn't nearly as good the next day after the dressing had soaked into everything. I still enjoyed it because it reminded me of her. Heat oil over medium-low heat in a medium skillet. Add shallots and saute until very tender and brown (about 15 min). Then set them aside and let cool. While shallots are cooking, bring a large pot of salted water to a boil, add broccoli florets, let the water return to a boil, and drain broccoli after about 15 seconds. 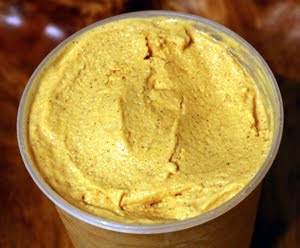 In a small bowl, whisk together the almond butter, garlic, lemon juice, honey, and water, and season with salt and pepper. Toss this dressing with the broccoli, shallots, apples, and pecans. Serves 8. I've never been a big fan of cranberry sauce, especially if it still has indentations from rings in the side of the aluminum can. No thank you. But, I found myself with 2/3 of a bag of fresh cranberries, so I thought about doing something with them for the Pre-giving feast. (Don't ask what happened to the other third of the bag. It was a catastrophe.) As luck would have it, I turned on the Food Network while I was working out on Saturday morning, and the Neelys were making this fabulous looking chutney that didn't involve 4 cups of sugar. Despite my trepidation for all things cranberry-based (especially considering the recent failure), I really liked this. It retained much of the tartness from the cranberries, but had just enough balance from the other fruit and honey to prevent my face from puckering up. To celebrate my first successful dish using fresh cranberries, I'm submitting this to Weekend Herb Blogging. Haalo from Cook (almost) Anything At Least Once organizes this event, and Winnie from Healthy Green Kitchen is hosting this week. I heard many good comments from my taste-testers, and we tried to figure out what you're really supposed to do with chutney. We mostly ate it by itself, but also decided that it would be good on yogurt. What's your favorite way to eat chutney? Melt the butter in medium saucepan over medium heat. Then saute onion, apples, and thyme until tender. 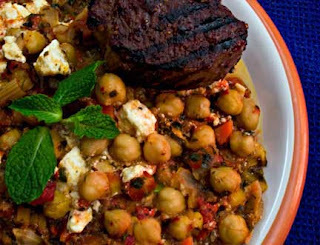 Stir in the rest of the ingredients, reduce heat to low, and let simmer for 20 min. Serve hot or let cool. Makes about 4 cups. When I was planning my pre-Thanksgiving feast, I decided to include a salad so that I could prepare it in advance and save oven space for other dishes. The last red cabbage salad that I made turned out fabulously, so I decided to give this one a shot. This brings up an interesting question: last time I made it, I called it purple cabbage... what's your preference - red or purple? No matter what you call it, the salad was good. It had a nice crunch, and a great mix of flavors. Next time I'll use a little bit less onion, but I've been finding raw onion very strong lately (my eyes watered for several hours after cutting Vidalia onions the other day... what's wrong with me?). I doubled the recipe, and realized that I would have two identical bowls of salad. I was already trying out tons of recipes, so I thought I might as well try a different dressing on each bowl. Because I can no longer eat my favorite wheat berry salad, I decided to use a similar version of its dressing. I preferred this sweet one (#2), but others liked the dilly one better, so I guess you can't go wrong. 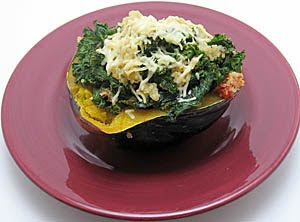 I've provided the smaller version of the recipe, so pick a dressing, or put it into smaller bowls and try both. Mix all salad ingredients in a large mixing bowl (if making well in advance, it's best to add the pecans until serving). Choose a dressing and mix those ingredients together in a small bowl. 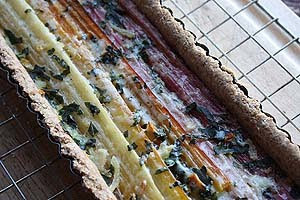 Toss with salad, and ideally refrigerate overnight. Serves 6-8. To my great relief, I'm only responsible for the sides this year. I realized that I had way too many recipes that I wanted to make for the big day (my short list was somewhere around 20), and after making way too much food last year and in an effort to preserve my sanity, I knew that I had to narrow this down. So, I invited some friends over on Sunday to be official taste-testers, and I got to work making 9 side dishes and 2 pies. I planned enough in advance that I had plenty of time, and had a relaxing weekend in the kitchen. I was having a fabulous time cooking and dancing around the kitchen until about an hour before my friends arrived. In my attempt to remove this gratin from the oven to press the top down, I lost my grip on the dish and about a quarter of it ended up on the bottom of the oven. Whoops! I was a bit flustered, but couldn't really do anything about it at that point, because the other things that were in the oven had about an hour left to cook. Slowly my apartment filled with smoke (luckily I disconnected the nearest smoke detector years ago, and shut my bedroom door in time to prevent that one from going off). When my friends started showing up, I was sweating, my eyes burned, and we had to open both of my doors to be able to breathe. The smoke finally cleared, and after cleaning my oven 3 times, it looks much better and only emits a small amount of smoke. Despite all of the chaos, I enjoyed the gratin. It wasn't the winner of the contenders, as the unanimous favorite was the butternut squash casserole (unfortunately people demolished that before I got a picture, but I'll be sure to post about it after I make it again for Thanksgiving). The gratin had great flavor, but was very simple. The milk was still somewhat liquidy when I first served it, but thickened up to a perfect consistency when I reheated it. If you want a heavier version, go with half-and-half or cream, but I like to keep things a little bit lighter when I have two tables full of food to eat. Heat olive oil in a small skillet over medium heat and saute onion until soft. Put this mixture aside. Slice the potatoes very thinly (I used a mandolin) and place a thin layer into a lightly oiled 9 x 13" baking dish, overlapping them quite a bit. Sprinkle the potatoes liberally with salt and pepper, add onions, and top with a third of the cheese. Add another layer of potatoes, salt and pepper, and cheese, and finish with the remainder of the potatoes (unless you have a lot left, and then you can do another layer). Pour milk over the potatoes until it reaches the bottom of the top layer of potatoes, and dot the top with the pieces of butter. Then bake at 350 for 30 min. 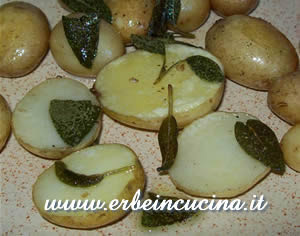 Remove from the oven (being careful not to spill half of it in the bottom), and press down the potatoes with a spatula. Continue to cook for 15 more min, and then sprinkle with the remaining cheese and cook for a final 15 min (or until the potatoes are tender). Serves 12. I doubt that I've ever had a King Ranch casserole that didn't involve canned soup... until now! 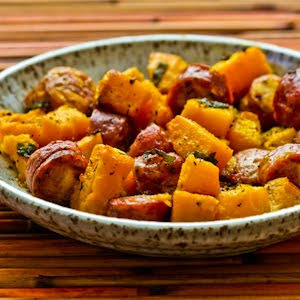 This is one of those comforting dishes that reminds me of my childhood, and I really liked this lighter version. It's still cheesy and delicious, but not greasy or heavy. Best of all, if you have some cooked chicken or turkey lying around, it's insanely fast to throw together. Heat the oil over medium heat in a medium skillet. Add onion and cook until it's tender. Then stir in garlic, paprika, cumin, and salt and pepper, and add chicken or turkey and green chiles. Stir this together well, and toss with cilantro. Cover the bottom of a small baking dish with 1/3 cup salsa and then add 2 of the tortillas (4 halves), overlapping them as necessary. 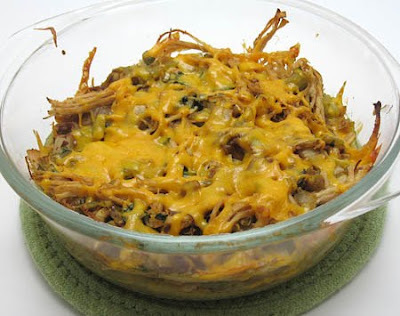 Top with 1/4 cup yogurt, 1/3 cup salsa, half of the chicken or turkey mixture, and 1/3 cup cheese. Repeat the layers: tortillas, yogurt, salsa, chicken mixture, and cheese. Top with the remaining cheese and bake at 350 for about 20 min, or until it's bubbly. Serves 4. Michigan weather has been unseasonably warm lately, but I've still been in the mood for soup. 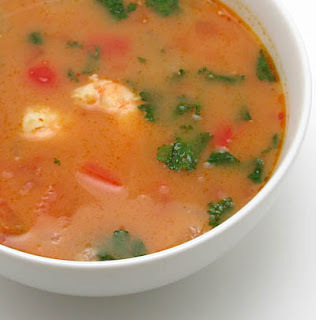 I had shrimp in my freezer from the local shrimp farm and this soup caught my eye. It's more of a summery soup, but that didn't stop me from enjoying it. Next time I'll add more shrimp, but otherwise it was perfect. Heat the olive oil over medium heat in a large saucepan. Add the onion, bell pepper, and garlic and cook until the veggies are tender. Then stir in the pepper flakes, tomatoes, water, and rice. Bring this to a boil, then cover, reduce heat, and let simmer for 10 min. Pour in the coconut milk and add the shrimp. Let it cook for a few minutes, until shrimp turn pink. Then stir in the lime juice and cilantro, and season with salt and pepper. Serves 6. Apparently pancakes have become an official birthday food. After going four years without making pancakes (as far as I can remember), I whipped up some teff pancakes for Dad's birthday in August. They were amazing. Even my parents, who aren't normally pancake lovers, raved over them. So when I wanted to make myself breakfast for my birthday yesterday, pancakes popped back into my head. It was tempting to make the teff ones again, but I also wanted to try something new. I decided to try a recipe with yogurt, and was very happy with the way that they turned out. 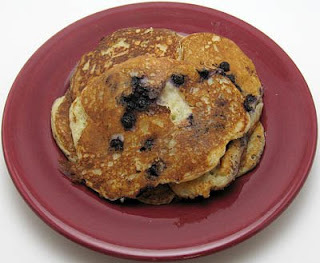 These were lighter than the teff version and more similar to "classic pancakes." I don't know that they were better, though (please don't make me choose!). I'm not sure why I don't make pancakes more often because they really don't take any time at all. Anybody have a birthday coming up that I need to celebrate? Combine egg, yogurt, milk, honey, oil, and vanilla in a small bowl. In a separate bowl, combine baking mix, baking powder, baking soda, and salt. Stir the liquid mixture into the dry ingredients and stir just until combined. Heat a small amount of butter or oil in a large skillet over medium heat and add 1/4 cup batter to the pan for each pancake (I fit 3 into the skillet at a time). Spread the batter out with the back of a spoon if necessary, and sprinkle with blueberries. Cook each pancake until lots of bubbles start rising to the top, and then flip it over and cook until it's nicely browned on the bottom. Continue with remaining batter. Makes 9 medium pancakes (serves 3). I'm engaged. (Calm down, Mom. Put down the phone.) You see, for the past few months I've been joking that I'm dating my dissertation. It's scary how far I can take this analogy, but I'll stick to the essentials. We had our honeymoon phase for the first couple of years, and then we sank into a love/hate relationship for the past few (let's just say that hate predominated... but I knew that I was in it for the long haul). I cried, I laughed (the voles can be extremely adorable when they're not trying to bite you), and we got into a few screaming matches. And today, it finally proposed (I finished collecting my data)! I know that there's a lot of work ahead in preparation for the big day but, barring extremely weird circumstances, it'll happen. I will get those three precious letters tacked onto the end of my name. Life is good. You might be wondering what this has to do with soup. You see, when I get really close to finishing a project, I neglect all desires of food or water because I'm so motivated to get the work done. But not today. I was excited to pry myself away from the microscope and have leftovers of this soup because I loved it so much. 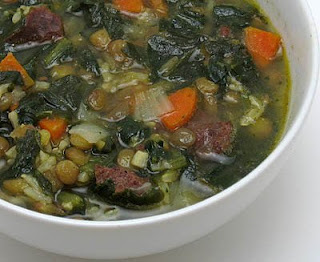 I love lentil soups and stews in general, but I think that this is the best one that I've ever made. It's simple, but it works brilliantly. If you're looking for a filling and comforting way to warm up this winter, I have your answer. Heat oil over medium heat in a large saucepan. Add onion, garlic, and carrot and saute until the veggies are tender (about 5 min). Stir in the sausage, break it up into small pieces, and let it brown for about 5 min. Then add the bay leaf and the stock, bring to a boil, and reduce heat to medium. Stir in the lentils and brown rice and continue to simmer for about 50 min, or until the rice and lentils are tender. Stir in frozen spinach after about 35 min of simmering time, or fresh spinach after 45 min. Serves 4. After my adventures in applesauce making, my freezer filled up quickly. In an attempt to prevent being attacked by falling freezer bags and containers every time I open the freezer door, I started clearing a few things out. I had apparently forgotten about a bag of edamame that was hanging out in the back. I love the stuff, but I never think to cook with it. After a quick search through recipes that I bookmarked a while back, I came across a recipe at The Reluctant Vegetarian for a quinoa and pineapple stir fry with edamame. It sounded amazing, so I went for it. I enjoyed this after I made it, but LOVED it the next day. It was good cold or hot. I loved the mixture of different textures, and it wasn't overly fruity (I sometimes have an issue mixing fruit with savory dishes). Two peppers made it fairly hot, but it was a great way to clean out my sinuses. I recommend using only one (or use milder peppers) if you're not a fan of spice. 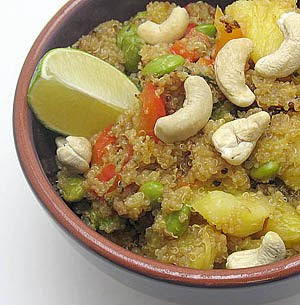 Combine the quinoa, water, pineapple juice, and 1/2 tsp soy sauce in a medium saucepan. Bring this to a boil, then reduce heat, cover, and simmer until all of the liquid is absorbed (about 15 min). Then fluff the quinoa with a fork and let cool. If there's time, let it refrigerate for a while before you continue. It's been a long time since I last added another entry to the Whole Grains 101 series, but I'm ready to get back to it with a controversial grain. There's a ton of debate about the classification of fresh corn. Is it a vegetable, grain, or "vegetable grain"? Well, it depends on who you ask but, in the end, does it really matter? I think we can all agree that when corn is dried, it's a grain. 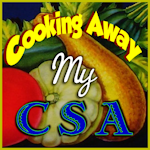 There's a ton of information on corn (people have written books on the subject), but I'll try to highlight the most relevant info to cooking. Let me know if you think I've left out important information. Corn is the most prevalent crop in the U.S., but most of it isn't eaten as "corn". Because of the enormous subsidies given to corn farmers, it's become a popular animal feed, and is used to make all kinds of sweeteners, additives, and preservatives. Don't get me started. Anyway, there are several varieties of corn, including sweet corn, field corn, flour corn, and popcorn, and each has it's own advantages and disadvantages. There are a ton of commonly-used forms of corn. Besides fresh corn, it is also eaten whole as popcorn or hominy. Hominy is corn soaked in lye solution (which makes the niacin available to the body), and then eaten fresh or dried. Dried corn and hominy can both be coarsely ground into grits, or futher ground into cornmeal (sometimes called polenta), corn flour, or masa harina (from hominy). Be careful, because often grits and cornmeal in supermarkets are not whole grain - look at the labels carefully. What does corn taste like and how is it used? I can't begin to describe the taste of corn without using the word 'corn,' so I will assume that everyone is familiar with its flavor. It's used in just about every way you can imagine - see the recipes below to get an idea of its versatility. Where do you buy and store corn? You can buy corn (fresh or frozen) at any supermarket. Fresh corn is best when it's in season in your area. You can buy frozen corn or blanch ears and freeze your own (either on or off the cob). Popcorn is also available in any store, but I prefer to buy mine locally. Whole grain cornmeal and grits can be a bit tougher to find, but often they're available locally, too. If not, they can be found at natural foods stores, and can also be ordered from Bob's Red Mill (they even have certified gluten-free versions) or Anson Mills. Canned hominy readily available, but the dried version can sometimes also be found at supermarkets, but is also carried by Mexican grocery stores and online. Fresh corn should be refrigerated until used (within a few days), and ideally in the husk. Whole grain cornmeal and grits should be stored in the refrigerator or freezer, as the oils in the germ will cause them to go rancid quickly. Popcorn and dried hominy can be stored at room temperature. How do you cook corn? To cook fresh corn on the cob, you can drop husked ears into boiling water for about 3 min, roast ears (still in the husk) in a 350 degree oven for 30 min, grill them (in or out of the husk) until tender, or steam in the microwave (in the husk) for 2 min per ear. Corn can also be cut off of the cob and sauteed. To cook dried hominy, first soak it overnight in water. Then drain and rinse hominy and place it in a crock pot with excess water. Cook on low for about 10 hours, until hominy is tender. If you don't have a crock pot, then simmer it in excess water in a covered pot until tender (1 to 3 hours). Once hominy is cooked, it can be refrigerated for about a week, or frozen in freezer bags for a few months. To make grits (using stone-ground, whole grain grits), bring 4 1/2 cups of salted water to a boil in a saucepan and then add 1 cup grits. Simmer, covered, until the grits are tender (50-60 min). To reheat grits, add a little bit of water or milk, stir well, and microwave or heat on the stove. There is a lot of debate on how to make polenta. The only way that I've done it is to stir 1 cup of cornmeal into 3 cups boiling water (or stock), whisking continuously until it pulls away from the sides of the pot (about 20 min, but it will depend on the grind of the cornmeal). You can also bake it, and some swear that you don't have to stir it the entire time (but why not get a workout while you're cooking?). 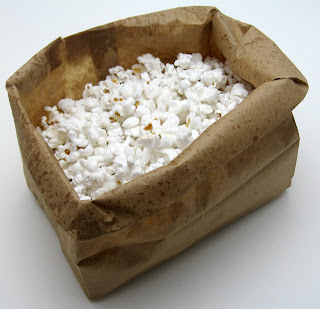 My favorite way to make popcorn (thanks to my mom) is to put a handful (or more) of popcorn kernels into a brown paper lunch bag, fold the top of the bag over several times, and microwave on the popcorn setting. I either eat it plain, or spray it with olive oil and sprinkle with salt or a spice blend. 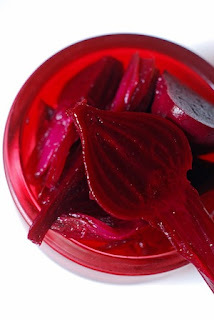 I was first introduced to the idea of making mixed-root vegetable mashes by my dad. While I was visiting my parents several years ago, he made a version of the Swedish dish rotmos that combined rutabagas, turnips, and potatoes. 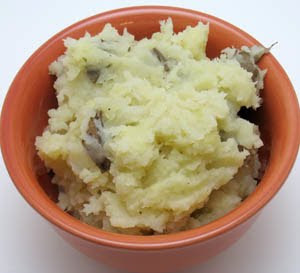 Earlier this week, I had a flashback to rotmos when I was trying to figure out what to do with parsnips, and decided to try a combo of mashed potatoes and parsnips. As luck would have it, I was flipping through cookbooks and found a recipe for this exact thing in The Whole Foods Market Cookbook. I knew that this was a sign that this book should be November's cookbook of the month (sorry I never got around to picking one for October!). I adapted the recipe some because of what I had on hand (the original recipe called for three times more potatoes than parsnips), but it was still wonderful. 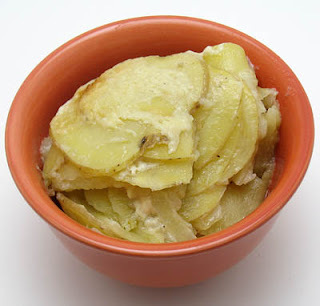 It had the great flavor of potatoes, with a slight sweetness from the parsnips. I did learn one important lesson: boiling parsnips creates a nauseating aroma, but they taste good in the end. I promise it'll be worth it... just stay out of the kitchen while they're cooking. Normally I roast parsnips, but this was a nice alternative for a change of pace. 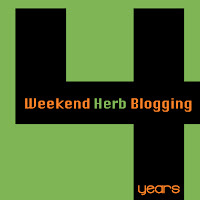 I'm submitting this to Weekend Herb Blogging, which is celebrating its 4th anniversary this week!! I'm very glad that Kalyn accidentally started this event, and I'm also grateful that Haalo from Cook (almost) Anything At Least Once does such a great job organizing it. Check out the rules and send Haalo your entries (she's even giving away a copy of The Spice and Herb Bible this week!). Peel the parsnips and chop them into small pieces, removing the tough inner core (I usually chop them lengthwise into quarters, remove the core, and then cut the quarters crosswise into smaller pieces). Chop the potatoes into pieces about the same size as the parsnips (peel them if you want, but I prefer to leave it on). Place the potatoes and parsnips in a large pot, cover them with water, and bring to a boil. Turn the heat down to medium and let them continue to boil, uncovered, until everything is very tender (about 20 min). Then drain the water off and mash the veggies with a potato masher. Add the butter, season with salt and pepper, and add milk until it reaches your desired consistency. Serves 5. This weekend I was able to relax for the first time in months. I honestly didn't know how to react at first, but then I ventured into the kitchen. I decided that I needed to make a ton of food for the Halloween party that I was planning to attend, not thinking that everybody else had that same thought (we ended up with a TON of food). I'm a veggie fanatic, so I decided to bring veggies and dip. Want to try a fun (but scary) experiment? 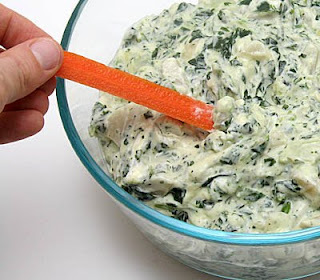 Try searching for a spinach dip that doesn't involve onion soup mix. Luckily Food Blog Search came to my rescue. This dip is amazing. It was best hot, and I "tested" it many times before I left for the party. It was still great even after it had cooled down, and I continued to eat quite a bit throughout the night. Apparently others agreed, because I heard several people talking about it, and a lot of it was gone. It's creamy and cheesy, but not at all greasy, which is my main problem with most cheesy dips. The next time I need a dip, I know where to turn. Heat oil over medium heat in a medium skillet, and then add onion and garlic and saute until tender. Stir in water chestnuts and spinach, season with salt and pepper, and cook for a few minutes. Add the cream cheese, parmesan, milk, and yogurt to the skillet and stir until cheese melts. Then reduce heat to low and continue to cook, stirring occasionally, for about 10 min. Makes about 6 cups. Next week's host is Haalo from Cook (almost) Anything At Least Once. See the rules to participate, and I can't wait to see what everyone comes up with next!